We should start by answering the question, “What is vertigo?” because many people just describe the feeling as dizziness. 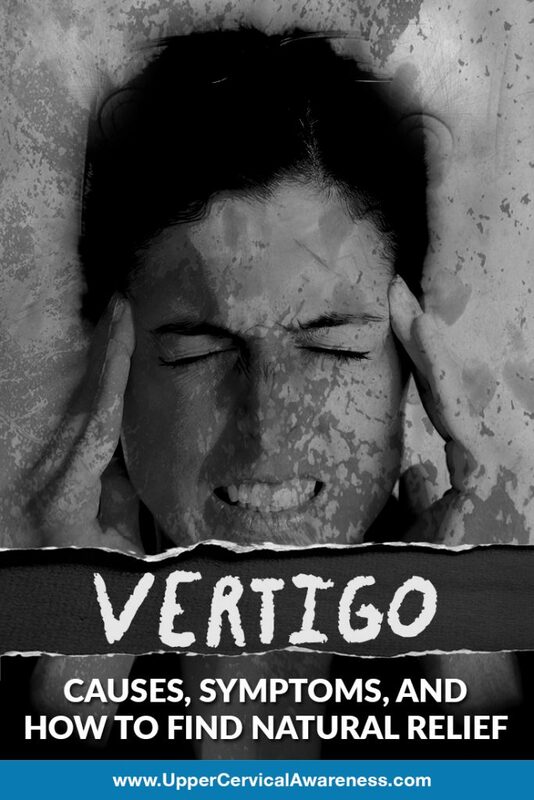 However, vertigo specifically refers to false sensations of movement. What you may think of first is a spinning sensation (like you would get when you were a kid after they spun you around for a game of pin the tail on the donkey). However, vertigo can present as other false sensations of movement such as a swaying or tilting feeling. As you can see, vertigo can easily be responsible for a fall, and there are a few emergency causes of vertigo, though most cases are benign. We’re going to look at some of the possible causes of vertigo as well as some of the additional symptoms that go along with those causes. We will conclude our article with a natural therapy that is bringing hope to many people who suffer from recurring cases of vertigo. That’s quite a mouthful, so you’re going to hear it referred to as BPPV or simply positional vertigo in most cases. Positional vertigo is the most common cause of vertigo and relates to the fact that the position of the head plays a role in vertigo occurrence. For example, things may start to spin when you bend over to pick something up, or if you turn your head to a certain side. The good news about positional vertigo is that it usually only last from a few seconds to a few minutes. The bad news is that is long enough to cause a dangerous fall. If you are suffering from longer and more severe bouts of vertigo, this may be something doctors look into even though it is relatively rare (about 0.2% of the population). There are three other symptoms that make Meniere’s easier to identify. One is tinnitus, a ringing in or buzzing sound in the ear. Another is hearing loss in the affected ear. Finally, since Meniere’s is often related to increased pressure in the ear resulting from fluid buildup, you may have a feeling of fullness in the affected ear. Attacks usually last anywhere from 20 minutes up to 24 hours. The inner ear is known as the labyrinth. Sometimes this part of the ear becomes inflamed following a cold or flu. The inflammation can cause vertigo that lasts beyond the end of the virus, but it should clear up within a week or two after you feel better. Some people find that vertigo is worst when they blow their nose if this is the underlying problem. Many medical sites mistakenly confuse this with labyrinthitis because it usually occurs after a cold or flu and goes away in a similar time frame. However, the inflammation is in a different location. With vestibular neuritis, it is the vestibular nerve itself that becomes inflamed. This nerve (also called the 8th cranial nerve), is the one that sends messages between the ear and the brain. While the swelling exists, these messages may get all mixed up, leading to vertigo. While not as common, a heart attack or stroke can cause vertigo. It is important to know and recognize the symptoms of these emergency situations, so you can seek immediate medical help if they arise. If you are not experiencing any other symptoms of a cardiac condition, your vertigo probably only poses a fall risk. But use your own judgment when determining whether to call for emergency assistance. As long as vertigo is not a symptom of an emergency situation, there is a natural way to get help that we would like to recommend and that is upper cervical chiropractic care. What does upper cervical chiropractic involve and why does this help some vertigo patients? Focused – The practitioner will only focus on the top two bones in the neck. This allows for precision adjustments that can help the central nervous system to function optimally. Gentle – Low force corrections are tailored to each patient and administered either manually or with an adjustment device. There is no popping or twisting of the spine, and adjustments may hold in place longer as a result. As-Needed – The practitioner will perform an examination before the adjustment. If your adjustment held from last time, you won’t receive one, and you may even be able to space your visits out further. Maximizes blood flow to the brain – Since the upper cervical vertebrae help to facilitate blood flow, a subluxation could be inhibiting the proper flow. Optimizes brainstem function – The C1 (top bone in the neck) surrounds the brainstem. Even the slightest misalignment may apply pressure and inhibit proper function. Relieves pressure on the Eustachian tubes – The eustachian tubes carry excess fluid away from the ears. If a misaligned atlas is inhibiting this release (which is possible due to proximity), the ears may fail to drain properly. Some practitioners have detected gradual lesions that form over the course of 15 years, so you may have had the misalignment for a long time before vertigo and other symptoms set in. If you are suffering from vertigo, especially if you have a history of head or neck injuries, seeking the help of an upper cervical chiropractor may result in improvements or even complete resolution of the problem. To learn more, schedule a consult with a practice near you.